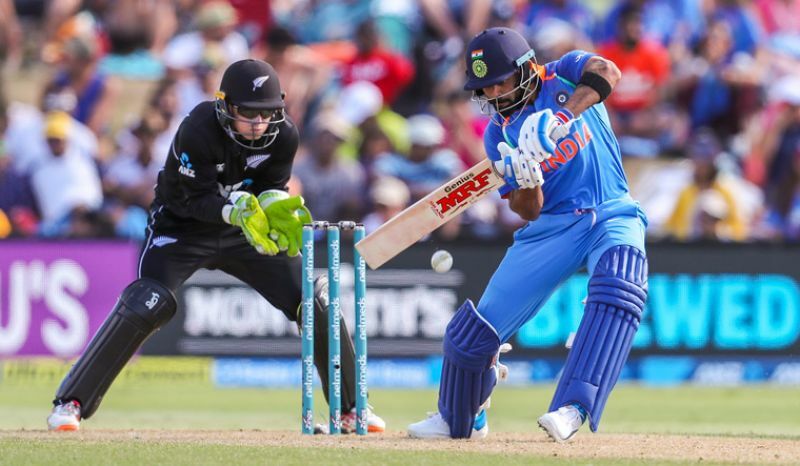 Mount Maunganui (New Zealand), Jan 26: Rohit Sharma (87) missed out on a chance to hit his first one-day hundred in New Zealand but India still managed a challenging 324 for 4 with all the batsmen coming good in the second ODI here Saturday. Shikhar Dhawan (66) also struck a half century while captain Virat Kohli (43), Ambati Rayudu (47) and Mahendra Singh Dhoni (48 not out) chipped in with significant scores as the vaunted Indian batsmen dominated the home bowlers after the visitors opted to bat. Rohit and Dhawan gave India a flying start with a 154-run opening stand from 25.2 overs during which the New Zealand bowlers were hit all over the park. Dhawan was the first to go as he reached out to a short and wide delivery from Trent Boult (2/61) only to thick-edged it to wicketkeeper Tom Latham in the 26th over. Dhawan, who set up India's win in the first match with an unbeaten 75, had nine boundaries in his 67-ball innings. Rohit, on the other hand, looked set for a century as he was batting beautifully but in the end fell short of the three-figure mark by 13 runs. Paceman Lockie Ferguson (2/81), who was generating a lot of pace, removed the dashing Indian batsman, who failed to put down a pull shot off a slower ball, in the 30th over. Rohit had nine boundaries and three sixes in his 96-ball innings. Rohit and Dhawan were out in quick succession but one-down Kohli and Rayudu did not give any respite to the Kiwi bowlers as the duo stitched 64 runs for the third wicket from 9.4 overs. Kohli was in his imperious touch as long as he was at the crease before he became Boult's second victim in the 40th over. India were 238 for 3 at the end of the 40th over and then Dhoni and Kedar Jadhav (22 not out) added 86 runs in the final 10 overs to post a challenging total. Dhoni hit five boundaries and one six in his 33-ball unbeaten knock.